Implementing digital concepts such as e-learning helps companies to develop the full potential of their employees and thereby set the course toward sustainable success. It should be the aim of an every company to improve, document, and uphold the quality of its products as this allows it to increase consumer safety and overall competitiveness. The necessary company-wide quality mindset and continuous improvement process can, however, only be achieved if every individual employee can join in on the challenge and continuously improve himself via ongoing training measures. According to the “Modern learning content for modern workers” study by the British market research company Towards Maturity in which 6,000 employees as well as 700 personnel managers and vocational education and training experts were addressed, 77% of employees look for attractive training programs that are designed to help them advance within their current job and career. 7 out of 10 state that they were convinced that additional vocational education and training would enable them to perform their job in the company more effectively and efficiently. These findings point to the conclusion that individual employees are in fact highly motivated to participate in suitable training measures and that the entire company would profit if said measures were made available. How do I Reach My Employees? In the private sphere employees today already use digital tools such as smartphone and the Internet to such a high degree that they quite rightly so take these technologies for granted. It therefore comes as no surprise that they expect to be able to utilize said technologies for vocational education and training purposes. This aspect also becomes evident if one looks at the findings of the “Monitor Digitale Bildung” study conducted by the German Bertelsmann Stiftung in which it addressed 1,000 persons from the general population and 500 vocational education and training experts. This study found that 74% of online-learners were convinced that expedient training measures were not possible without the use of new digital media. This allows the conclusion to be drawn that individual employees must be provided with suitable digital tools for so-called self-study that allow them to continuously improve themselves and their knowledge. The new e-learning functions in our training management module Qualify.Net allow employees to directly perform self-studies and check their individual level of knowledge via interactive questionnaires and tests. 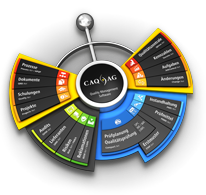 The CAQ.Net® web-applications play an important role here, as they provide employees with the utmost degree of flexibility regarding their self-study – the employee himself decides what, how, when, and where he wishes to study or take part in online tests. The validity of training documents and other applicable materials that the employee accesses throughout his self-study can be directly monitored via the document management module. True to the idea of a comprehensive management system, all updates or changes made to relevant training documents or new versions thereof can be traced system-wide. Initially developed for the ISO-compliant administration of employee qualifications, the software module Qualify.Net was in the past already significantly enhanced with elements for planning, documenting, and evaluating individual training actions. The addition of sophisticated e-learning functions has now further turned the module into a comprehensive training management system. The perfect interplay with the document and process management modules provides employees with 24/7 access to relevant company knowledge which they can internalize via self-study and check their level of knowledge via a web-based interface. All of this serves as basis for creating a dynamic and continuous improvement process which benefits everyone from the individual employee to the overall company.